More than 300,000 Drukpa people are dispersed across the three Asian nations of Bhutan (160,000 people in 1991), India (105,066 in 2001) and Nepal. They are found throughout Bhutan, but are especially concentrated in the western districts of Ha, Paro, Thimphu, Gasa, Punakha, Chhukha, Dagana and Wangdue Phodrang. The Drukpa do not refer to their country as Bhutan, but rather as Druk-yul—'land of the thunder dragon'. 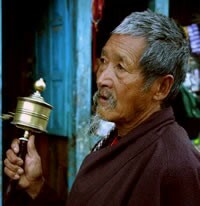 In India, some of the Drukpa have not been given status as a Scheduled Tribe, while others appear under the generic term Bhotia, which includes various groups of Tibetan origin. One source states, 'They inhabit hilly terrains of high altitude marked by extreme cold, high rainfall, medium snowfall and dense forests.' 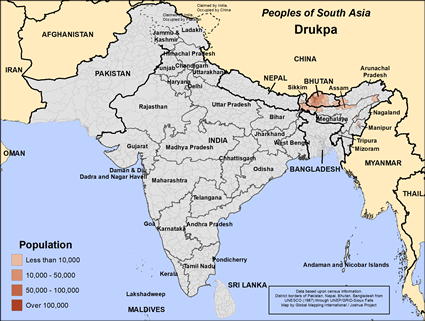 The Drukpa live in the Indian states of Arunachal Pradesh, Assam, Meghalaya, Sikkim and West Bengal. The first Drukpa moved to India during the latter half of the 7th century, when they conducted raids into today's north-east India. Some Drukpa have migrated into Nepal where they primarily operate as traders out of Kathmandu. The language of the Drukpa is called Dzongkha, which comes from two words, kha ('language') and Dzong ('fortress'). Therefore Dzongkha is 'the language spoken in the fortress'. These stone fortresses 'dominate the mountainous landscape of Bhutan from east to west and have traditionally been both centers of military and political power as well as centers of learning.' Bhutan was closed off to the rest of the world for centuries, as the dragon held this group under his tight grip of Buddhism. In India, where at least five ministries are working among them, there are an estimated 210 Drukpa Christians. One Drukpa recalls how he came to faith in Christ: 'In 1992 I was riding my motorbike on a very clear sunny day. Suddenly, my vision went blank followed by a gripping sense of darkness. I crashed my motorbike and could not move half of my body. I was a devout Buddhist and faithfully served our god. I sent my wife to ask the lama concerning my condition. The lama told my wife that some people had sent an evil spirit to kill me and that I would die within a week. My sister-in-law was already a Christian. When she heard of my condition, she brought along her Christian friends to my house. They started praying and applied oil on the paralyzed part of my body. Immediately I was able to move. I was completely healed. They preached Christ to me and I readily gave my life to Jesus.' He later went on to help translate the New Testament into the Dzongkha language, and he has personally led more than 100 Drukpa people to faith in Christ. View Drukpa in all countries.